Updated 7:30pm ET: The U.S. House of Representatives Tuesday night approved an additional $33.7 billion in funding for emergency spending on recovery efforts aimed at helping those devastated by Hurricane Sandy. The final vote came after the House had passed another $17 billion in spending earlier in the day. The approval of the $50.7 billion came only after political debates over spending that does not directly go to the areas impacted by the super storm. The House GOP leadership carefully orchestrated a multi-stage process designed to permit Republican members to vote for some Sandy aid, but not the full $60.4 billion the Senate OK’d last year, if they objected to that much spending. By designing the process in this way, the GOP leadership made it highly likely that the total package will ultimately become law after the Senate acts next week. It's been two and a half months since Superstorm Sandy barreled through New Jersey and New York, but people are still desperately awaiting aid. NBC's Katy Tur reports. On the $33.7 billion segment of the bill, a group of northern Republicans joined with Democrats to push the measure to passage, on a vote of 228 to 192. Finally, in something of an anticlimax, the House approved the entire $50.7 billion measure on a vote of 241 to 180. In that vote, 49 Republicans joined 192 Democrats to approve it, while one Democrat and 179 Republicans voted to oppose. Fiscal conservatives, who objected to spending not directly related to Sandy, were able to trim only relatively small amounts of money from the bill, for example $9.8 million for a wildlife refuge in Connecticut and $150 million for Regional Ocean Partnership grants. In an earlier key vote, the House defeated a proposal by Rep. Mick Mulvaney, R-S.C. to offset the $17 billion in Sandy funding by a 1.63 percent across-the-board cut in non-Sandy discretionary spending. The amendment was part of an effort to avoid adding spending to the federal balance sheet. The GOP leadership’s cautious handling of the emergency funding came after an embarrassing fracas on New Year’s Eve when House Speaker John Boehner would not permit a vote on a $60.4 billion aid bill, sparking harsh criticism from New Jersey Gov. Chris Christie and House members from the Northeast. In a joint statement, Christie joined New York Gov. Andrew Cuomo and Connecticut Gov. Dan Malloy, both Democrats, in praising the House action: "We are grateful to those members of Congress who today pulled together in a unified, bipartisan coalition to assist millions of their fellow Americans in New York, New Jersey and Connecticut at their greatest time of need. The tradition of Congress being there and providing support for Americans during times of crisis, no matter where they live across this great country, lives on in today's vote in the House of Representatives." 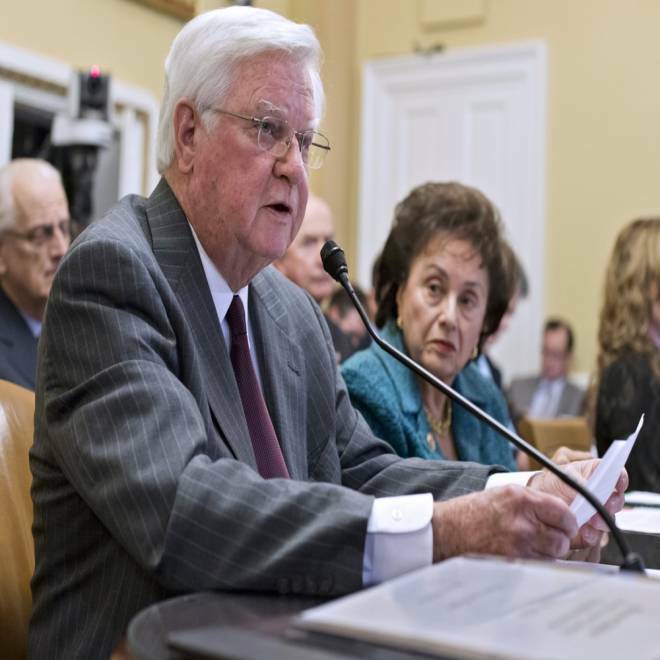 At issue Tuesday were two measures, one costing $17 billion, offered by House Appropriations Committee Chairman Hal Rogers, R-Ky., and the larger one of $33.7 billion, offered by Rep. Rodney Frelinghuysen, R-N.J., a senior member of the Appropriations Committee. House Appropriations Committee Chairman Rep. Hal Rogers, R-Ky., left, and Rep. Nita Lowey, R-NY, right, testify before the House Rules Committee at the Capitol in Washington, Monday, Jan. 14, 2013. Some House Republicans remain alarmed at the large outlays and the additional debt that they will necessitate. He defended his call for offsetting spending cuts, saying to his colleagues: “Just tell me what you’re willing to do without” in order to pay for helping victims of Hurricane Sandy. The Club for Growth, a conservative advocacy group, said it would put all three votes, on the two bills and on the Mulvaney amendment, on its vote-rating scorecard to hold members accountable in the 2014 elections. Earlier Tuesday Rep. Cory Gardner, R-Colo., defended the bipartisan effort by Colorado members to add to the emergency bill $125 million for watershed protection and flood mitigation, including about $20 million for areas in Colorado burned by last summer’s wildfires. The watershed protection money was in the Sandy bill that the Senate passed last month. The House Rules Committee rebuffed Gardner’s effort Monday night, but he said he hoped Colorado's two senators will make efforts to add the money when the Senate debates the emergency bill next week. “The title of the bill is ‘The Disaster Relief Appropriations Act.’ That’s the name of the bill. It’s not the ‘Sandy Disaster Act.’ It’s not the ‘Sandy Relief Act.’ It’s a disaster relief act. New Yorkers weren’t the only ones who had their homes burned down in a devastating natural disaster. We had over 600 in Colorado alone,” Gardner said. “If we’re going to have disaster assistance for people in this country who truly need it – because we are all in this together -- then we shouldn’t just cherry-pick Northeastern United States versus Southwestern United States,” he added. None of the short-term tactical maneuvering on Tuesday addressed a serious and growing problem: the increasing frequency of catastrophic weather events is making it more difficult to prepare the federal budget and to do long-term fiscal planning. If catastrophes require adding $60 billion a year in new spending, it is in effect creating another large Cabinet department every year, without the money to do so.